Pixar always picks some sort of computer graphical effect which has never been attempted before and perfects it, showcasing it in their newest film. With Finding Nemo, the effect on display is obviously water. And, once again, Pixar succeeds not only in the special effect but in making a wonderful film. This company is definitely on a roll. 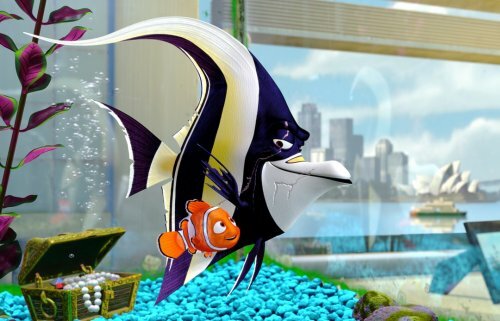 Finding Nemo focuses on the father-son relationship between Marlin (a clownfish, voiced by Albert Brooks) and his only son, Nemo (Alexander Gould). A tragedy in Marlin's past has made him fearful of the future, and when Nemo is captured by a deep-sea diver, those fears mercilessly come true. The two then must overcome their fears in order to find each other, and find each other they do not only physically but emotionally as well. 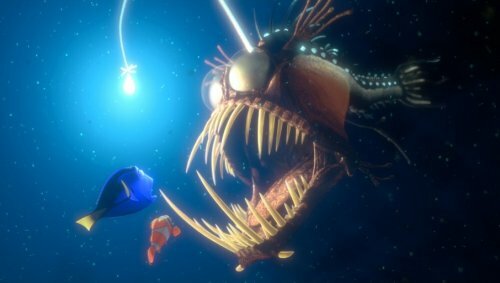 It gets especially deep when Marlin and his new and forgetful friend, Dory (Ellen Degeneres), make their way so far down to that part of the ocean where even light cannot penetrate and find themselves face to face with one of the most vicious-looking fish that you have ever seen (see above). And that is just one of Marlin and Dory's many adventures as they search the entire ocean for young Nemo. They encounter sharks (who are trying to change their ruthless image), sea turtles Crush and Squirt ("like, totally..."), jellyfish, pelicans, and more. Meanwhile, Nemo has been taken to an aquarium in a dentist's office in Sydney, Australia. Here he meets several domesticated fish, including a starfish and even a shrimp, as well as another fish who is also from the ocean, named Gill (Willem Dafoe - below, with Nemo). 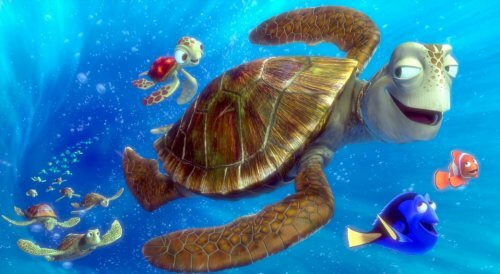 Gill identifies well with young Nemo and helps Nemo to prove himself and to overcome his obstacles in life. This includes Nemo's desire to escape and to eventually find his father. The film is a marvelous achievement on every level. The special effects (visual as well as sound effects), the music, the casting...they were all excellent. But the true gem of this film, as is the case with most of Pixar's blockbuster hits, is the story. We are given a superb story about a father and a son...about growing up and about letting go. It is absolutely wonderful and was a extra-special treat for me to see this with my daughter and my dad on Father's Day. Finding Nemo also has a lot of great humor (again, this too is a common trait of Pixar films). 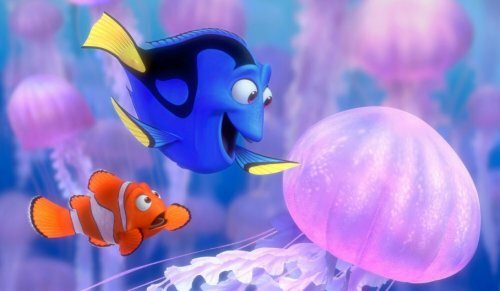 Ellen Degeneres steals the show as Dory, the absent-minded Blue Tang fish whose short-term memory is absolutely horrible. The best part of the whole movie is when she tries to talk "whale." Here she is pictured below naively playing with a jellyfish while Marlin looks on in horror. 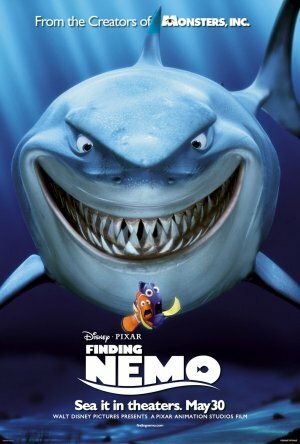 How would you rate the movie Finding Nemo? There have been 160281 people to visit this page since Sun, Jun 15, 2003. And you are the first person to visit this page today!